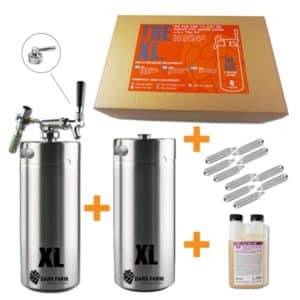 THE PREMIUM 20L (2 x 10L) MINI KEG 'XL' KIT: ALL YOU NEED TO STORE AND POUR YOUR PERFECT PINT – LIKE A PRO. Order before 7pm for next day dispatch. 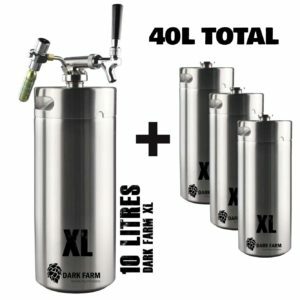 If you’re into homebrewing then these 10L mini kegs are an ingenious alternative to buying, cleaning, filling and storing all those bloody bottles! Saving you precious time and space. We’ll drink to that. 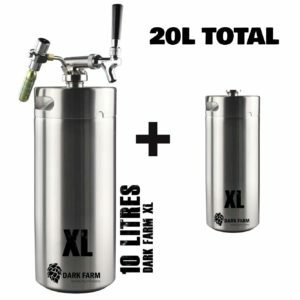 1: FILL your 10L mini keg with your favourite brew. 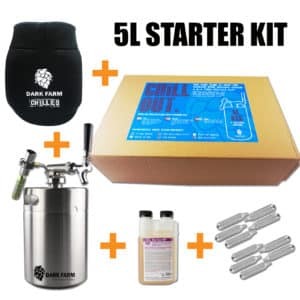 Craft your own or hit up your local brewery / tipple makers. 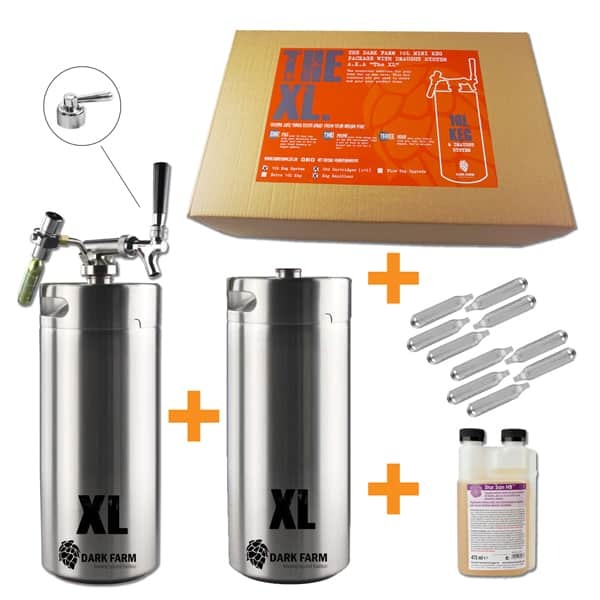 2: PRIME your brew using one of the C02 cartridges. Like a bit of fizz in your drink? Let it sit for a bit! 3: POUR your pint like a true pro. Sip. Pour. Sip. Repeat. You’re welcome. So, you enjoy a good beer. You have your standards. And you want it to taste how it does when you’re at your favourite pub. But life doesn’t always allow for those kind of nights out. 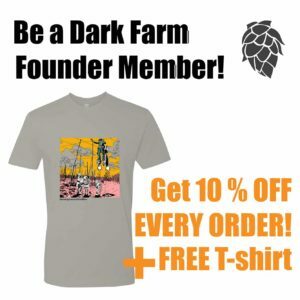 Bring the brew home to you! Your mini kegs are fully portable and reusable so you can stock up on your favourite tipple and enjoy it – poured with perfect bubble to brew ratio – at home or anywhere you want to bring the party. Our kegs aren’t just perfect for lovers of beer, by the way! 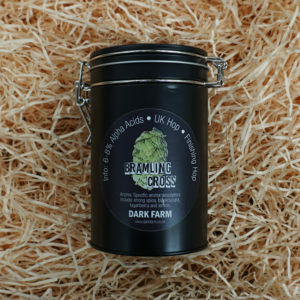 Customers rave how brilliant they are for brews like cider or even for serving cocktails. 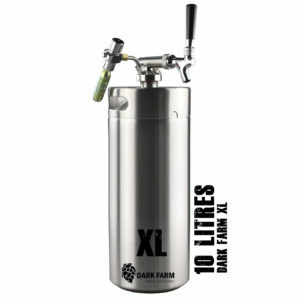 Using the Dark Farm mini keg means that you get to skip the priming stage in homebrewing. The CO2 valve will control the pressure within the mini keg keeping the level you set for weeks; allowing you to create that perfect balance of bubble to brew. For homebrewing the mini keg/growler can be used as the ideal storage for secondary fermentation as well as serving that perfect pint. Without the hassle of having to wash, label and store loads of bottles. How many kegs do you want in your box?